Our own colors are green and white. Green Prochloron, white spicules. I am a zoologist deeply loving colonial ascidians and interested in their life. As a sessile organism who cannot escape from dangers in habitat, the functions of integumentary tissues should be very important to survive in hazardous environment. Morphological and functional diversity of the tunic (and tunic cells) is one of my main subject to be explored. The major component of tunic is cellulose: tunicates (ascidians and the other urochordates) are the only metazoan group that can synthesize cellulose. Thus, cellulosic integument, such as tunic, is a synapomorph of tunicates (= urochordates). 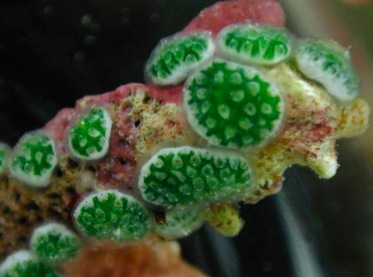 Algal symbiosis is another research subject in these years, since some colonial ascidians harbor cyanophytes. Tunic and tunic cells are often involved in the process of transmission of the algal symbions from the mother colony to their progeny. I also study some other photosymbiotic metazoans inhabiting coral reefs. Trididemnum cyclops: one of the most beautiful tunicates I believe. The colony harbors symbiotic cyanophytes Prochloron. I had studied on the colony specificity (self or non-self recognition) in botryllid ascidians since1985 as an undergraduate and graduate student at the Laboratory of Embryology (Prof. Hiroshi Watanabe), Shimoda Marine Research Center, University of Tsukuba. I got doctoral degree from University of Tsukuba on March 1991. Thesis title: Colony specificity and possible allo-recognition sites in Botrylloides (Ascidiae Compositae). Now I am a professor of invertebrate zoology (Department of Chemistry, Biology & Marine Science, Faculty of Science, University of the Ryukyus, Japan).